Think of the most beautiful beaches in the world and your mind may take you to Thailand, Fiji or the Caribbean – but you may not have to travel quite that far to find the best. With its deep blue waters and smooth white sand, the stretch of coastline looks like it’d be closer to the Med. But those living in the UK would be proud to know it’s actually on home turf – and you can find it an hour from the M4 in Pembrokeshire. Surrounded by the rugged coastline and dunes, Barafundle Bay is only accessible by walking half a mile from the nearest car park. With no cafes or facilities, all it has to offer is natural beauty. Passport Magazine, who say the beach has been consistently voted one of Britain’s best, describes it as a ‘visual overdose of beauty’. 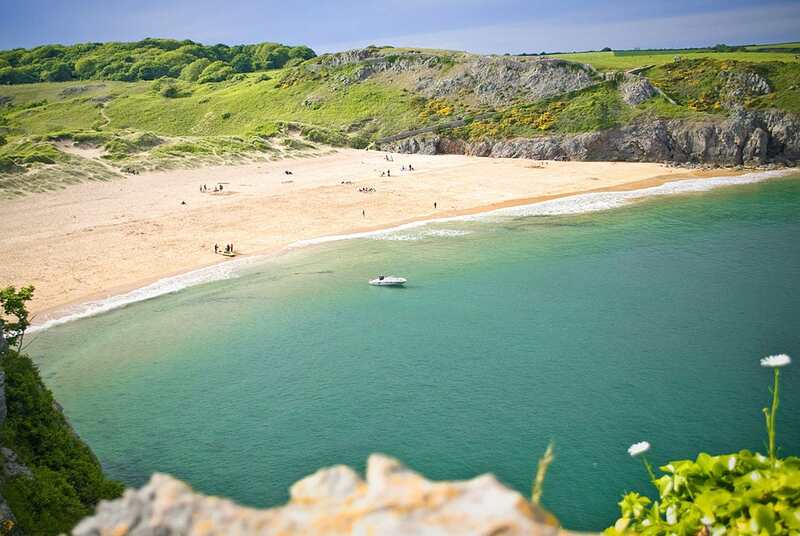 Barafundle Bay, part of southwest Wales’ Pembrokeshire Coast National Park, is a revelation – all the more so for the process of arriving there. As you approach by car, rolling countryside turns more dramatic, sheer and craggy cliffs dropping precipitously to the sea. It goes on to explain how the drive to the car park takes you through a National Trust site and part of the Wales Coastal Path before having to walk over the dunes to reach the beach. It’s been consistently voted one of Britain’s best by whomever votes on these things, and it’s easy to see why: it’s a luxuriant curve of sand, topped by dunes and grasses on hills that make it feel immensely private. The long stretch of cliff known as Stackpole Head sticks straight into the sea like an arm. A little boulder sits jauntily offshore. The waves crash against the smooth sand. Your company here? Twelve people, four dogs, and a visual overdose of beauty.